Now & Then: Dome Sweet Dome – Capitol Neighborhoods, Inc. The capitol dome defines the skyline of central Madison. But it was not the first dome nor the first capitol building—and there had been another dome at the top of Bascom Hill. Both communicated the dignity of important institutions. By the time this postcard was published circa 1900, Wisconsin’s second capitol represented the work of at least three architects. The 1868 dome was by Stephen Vaughan Shipman, a hero of the Civil War. The current capitol is the third to stand in Madison. The second statehouse was built from 1857 to 1869, mostly to the design of August Kutzbock, then Madison’s premier architect. 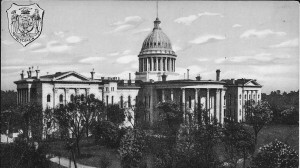 When completed, the new capitol did not have the lantern-like dome Kutzbock had intended, but rather a grander dome designed by architect Stephen Vaughan Shipman modeled on the recently completed dome of the U.S. Capitol in Washington, D.C. The disagreement over the dome caused Kutzbock to resign as capitol architect and depart for California, though he later returned to Madison where he took his own life in 1868. In 1903, recognizing the shortcomings of the second capitol, the legislature approved a Capitol Improvement Commission. Their work became essential when, in February of 1904, a gas jet that had been left burning started a fire in the west wing that spread vigorously. Parts of the statehouse survived, including the dome, but its fate was sealed. Just over three years later, construction began on the statehouse that still stands in the center of Madison’s isthmus. 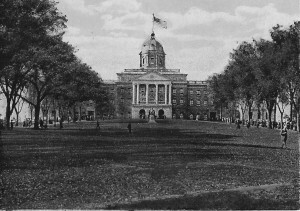 Main Hall, now known as Bascom Hall, had a dome that was destroyed by fire in 1916. Photos of the conflagration are available online. Not long before the new capitol was completed in 1917, fire struck the dome atop Bascom Hill. In October of 1916 a fire of unknown origin completely destroyed the dome on Main Hall, as it was then known. The building had a dome when it first opened in 1859, though the multi-purpose structure had been enlarged and improved. It was a dome completed in 1898 that burned 18 years later. Though covered by the state insurance fund, the dome at Main Hall (now Bascom Hall) was never replaced. Though that same fund was nearly depleted when fire struck the capitol 12 years earlier, there was already momentum to raise a new building with a grand new dome.